Germans adore engineering and the country is filled with technical museums covering every possible theme (cars, airplanes, grain threshers, wire, x-ray machines, wallpaper, corkscrews, etc.) 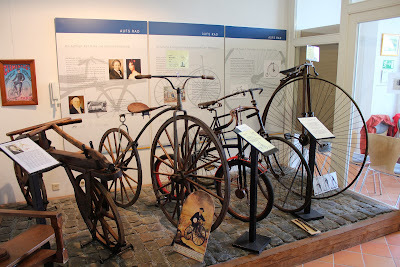 and in the wine district of the Rhineland-Palatinate, not very far from Frankfurt and not very far from where Baron Drais invented the bicycle (or at least its forerunner) in 1817, a small band of enthusiastic individuals have established a charming museum dedicated to our beloved two-wheelers in an old Schloss. Welcome to the Rhine Hesse Bicycle Museum in Gau-Algesheim! Gau-Algesheim, found between Bingen and Mainz and situated 3 kms from the west bank of the Rhine, is a town of nearly 7,000 inhabitants. First mentioned in chronicles in 755 it was raised to the status of a town in 1355 and is surrounded by vineyards. A charming town it does not actually have much to distinguish it from the others in the region except for the impressive Schloss Ardeck, a castle that has been much reconstructed since it was first built in 1112, becoming property of the town in 1925. 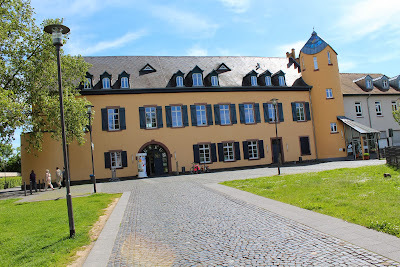 But, as is often the case in Germany where there are a lot of impressive old castles in addition to all those technical museums, it is not always easy to find a use for them and Schloss Ardeck was used for numerous local purposes over eight decades. Enter Prof. Heinz-Egon Rösch, a retired academic who taught sports subjects at the Universities of Mainz and Düsseldorf. 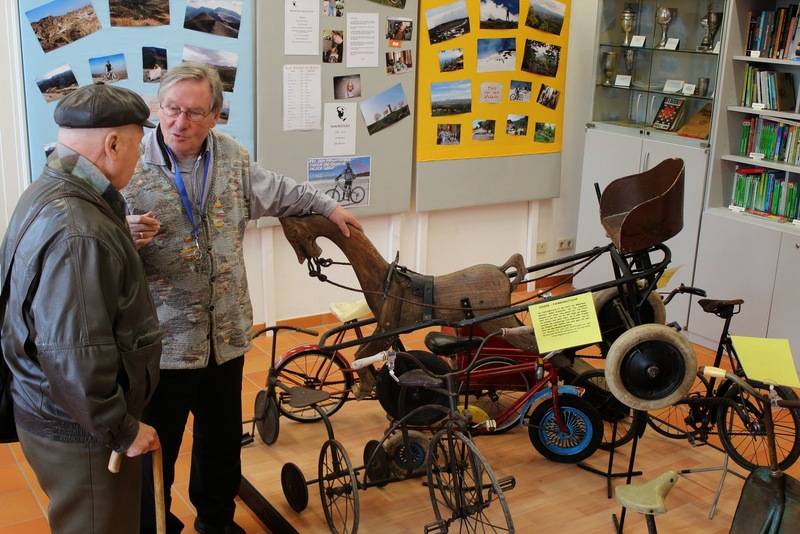 A singularly energetic man, he has had 15 cycle touring books published in addition to his academic work and at 82 years of age still rides 4,000 kms annually. 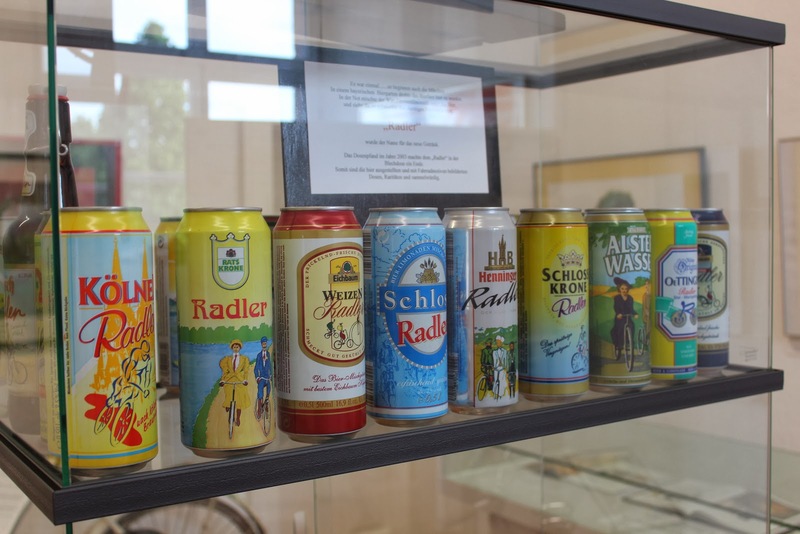 With his contacts in the bicycling community he realized that there were some excellent examples of cycling history available that people were willing to donate. 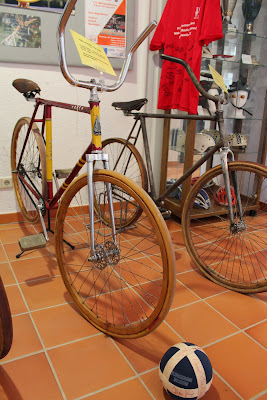 With the assistance of the local cycling club and some financial backing by the State of Rhineland-Platinate the Rhine Hesse Bicycle Museum (das Rheinhessische Fahrradmuseum) opened its doors to the public in 2002, occupying the ground floor of Schloss Ardeck. Staffed by volunteers, including the irrepressible Prof. Rösch, the museum is open on Sundays and holidays from Easter to the second Sunday in October from 2 to 6 pm or you can give them a call too. 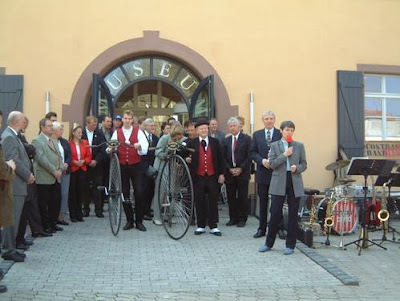 The museum is featured in the book "111 Places You Must See in Rhineland-Palatinate." 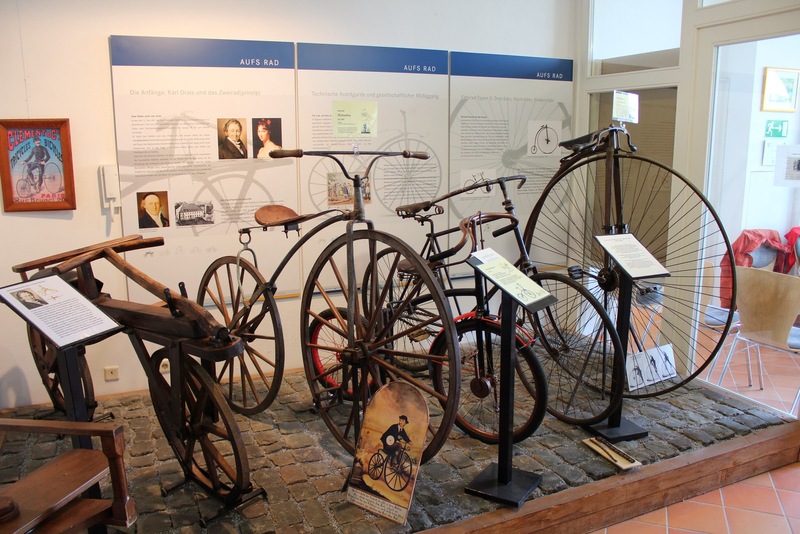 Entering the museum (admission is free but donations are welcome) one first enters a nice exhibition area devoted to the origins of the bicycle which economically shows the changes from the draisine to the bone-shaker to the high-wheeler and ultimately to the safety bicycle. 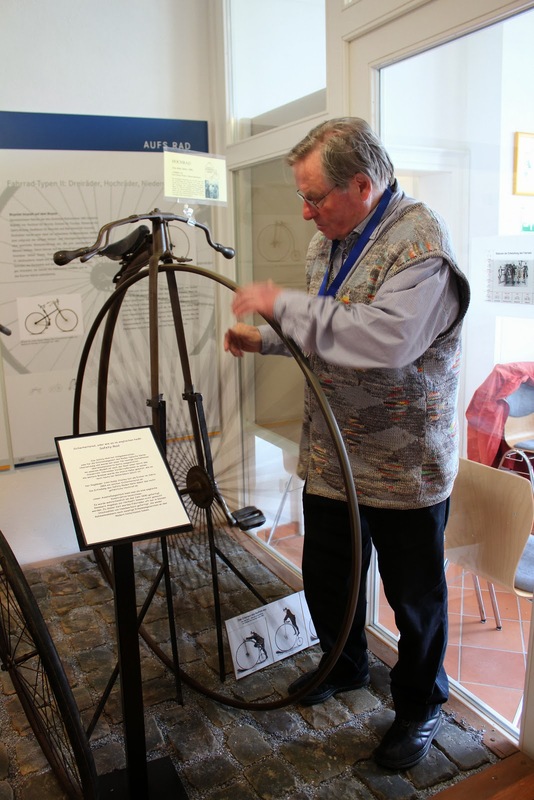 Turning to the left, one next enters the exhibition area covering bicycles used in daily life. 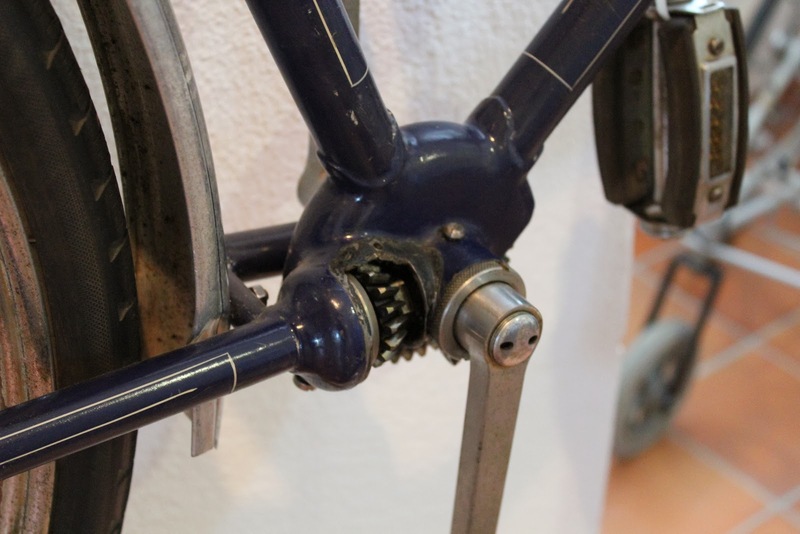 Here there are solid Dutch roadsters, an impressive shaft-drive Dürkopp, a Diamant with a carbide lamp and a knee-wreckingly massive chainring and other ancient but honourable machines. Another left turn takes us into the room devoted to bicycle sports. In addition to a number of classic road racing machines (Gios, Bauer, Pinarello) there are some excellent time trial bikes, including a spectacular yellow Giant used by Laurent Jalabert of the ONCE team. 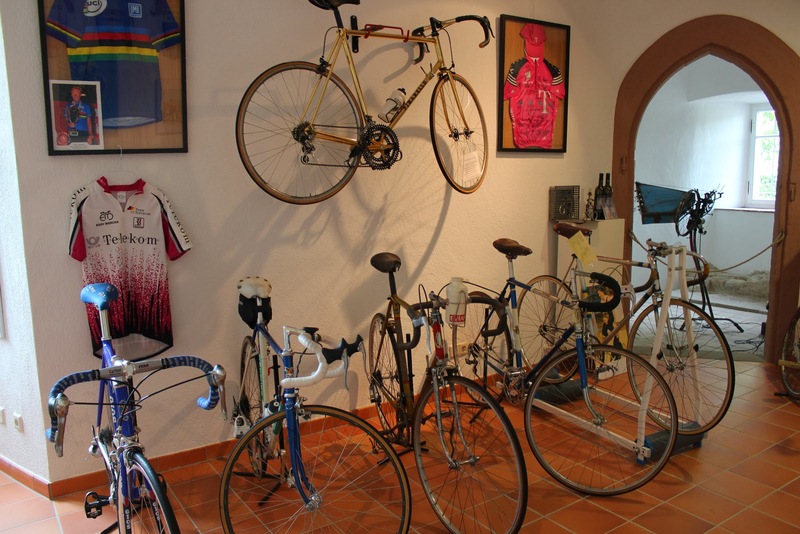 There are the usual items to be found in bicycle museums along with the bicycles themselves: waterbottles, posters, accessories, flags and trophies. This being Germany there is also a display exhibiting cans and bottles of Radler, the beer and soft drink combination known as a shandy or panaché in other countries. Something very unusual is an example of the bicycle used for Radball, the UCI-recognized sport of, well, bicycle ball (what is this actually called). Imagine bike polo with no mallets but instead you move the ball with your front wheel. Even stranger is Kunstrad, where cyclists, sometimes two on one bike, perform stunts more often seen in a Chinese circus before a panel of serious UCI-qualified judges. 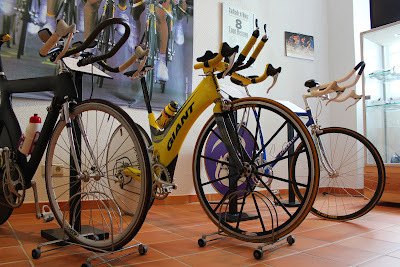 Crossing to the other side of this compact but nicely arranged museum where everything is lovingly labelled there is a display of children’s bikes and an area where children’s educational events are held. 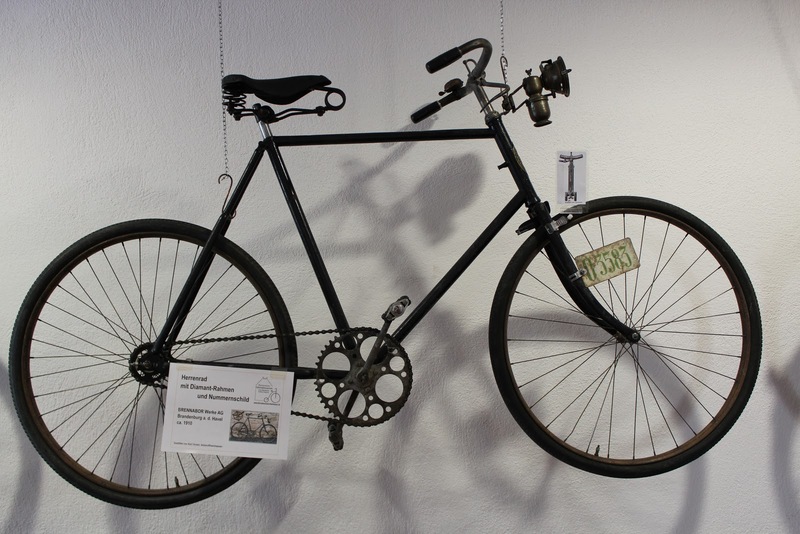 The final area is devoted to changing exhibits and during our visit featured a display about bicycles and art. 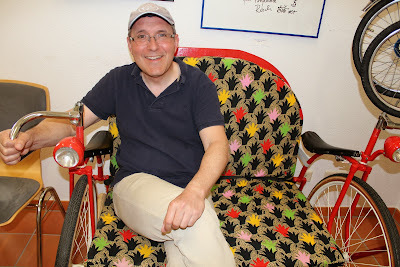 In addtiion to posters and some original paintings and three dimensional pieces there was a couch with wheels and handlebars. 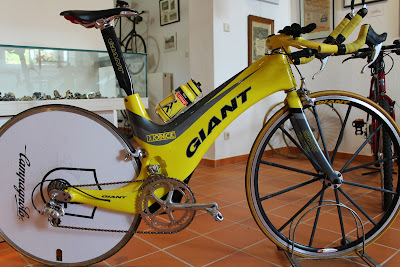 Every cyclist should have one of these in his or her living room! Prof. Rösch has found a successor (a more recently retired person) and his band of six will continue to manage the little museum. 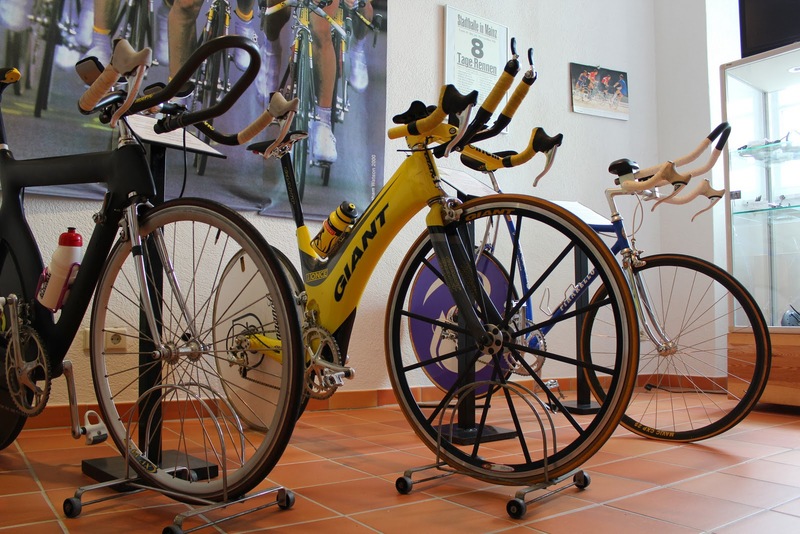 Cycling events take place from its front door and the local tourism office has prepared maps and brochures for suggested riding routes in the area. 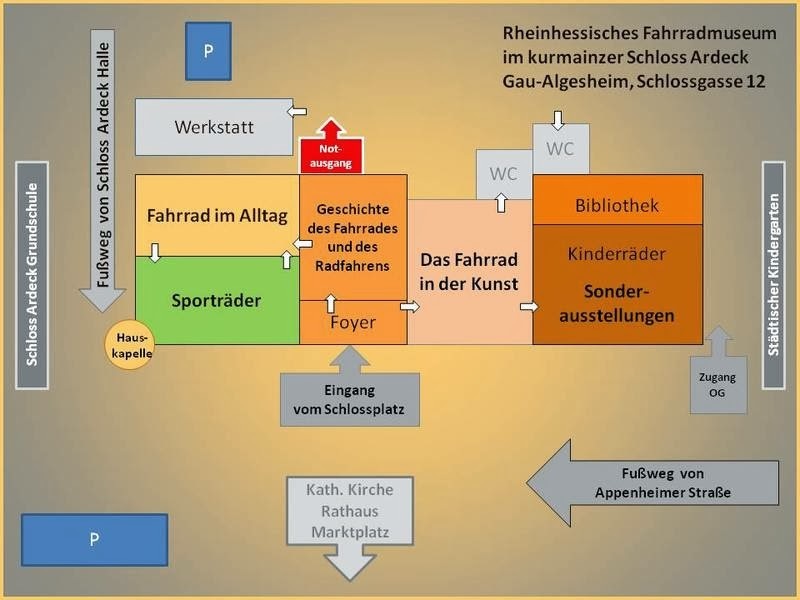 Educational programs for the local children have been successful and the Rhineland-Palatinate probably does not need to worry about where the next generation of cyclists will come from. 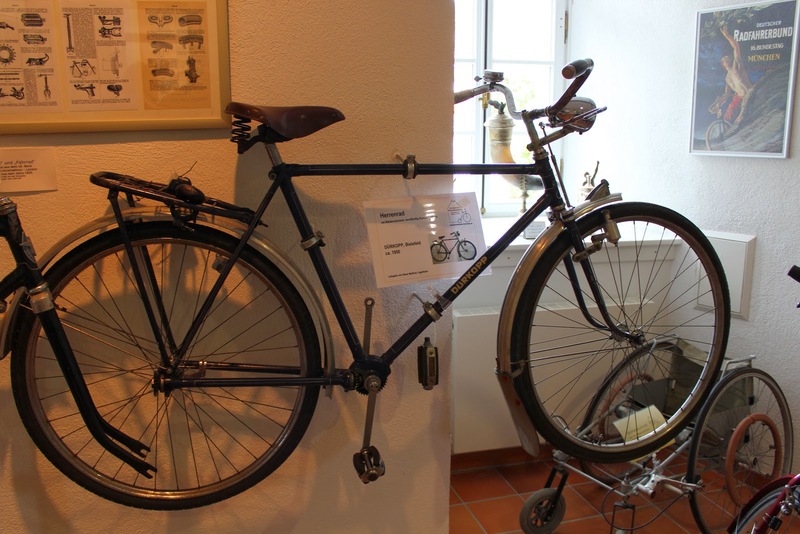 Modes but charming and surprisingly effective in telling the story of the bicycle, the Rhenisch Hesse Bicycle Museum is well worth a visit. And you can be sure that Prof. Rösch can tell you where to go for a most excellent glass of Rhine wine afterwards! The town of Gau-Algesheim has its website (with bits in English!) here.